The corinthian style of helmet originated in Corinth and was favored because of its protective shape. The Royal Corinthian Helmet with Plume replicates this original protective style, while adding ornamentation that is both decorative and functional. This helmet is made from blackened steel and features attractive brass adornments that serve not only to improve the overall look of the helmet but also make it far more noteworthy. The helmet features a classic corinthian style, including a covered back and an open, T-shaped visor that protects the face without restricting vision overmuch. Sitting above the helmets face is a brass lion emblem, while serpentine dragon designs decorate the side of the helmet. A wide, blond plume sits on top of the helmet, and in ancient times, a plume such as this would designate an important figure on the battlefield. In many ways, a helmet this ornate signified a general or a commander, someone that any solder should be able to quickly locate, just be looking for the plume on their helmet. 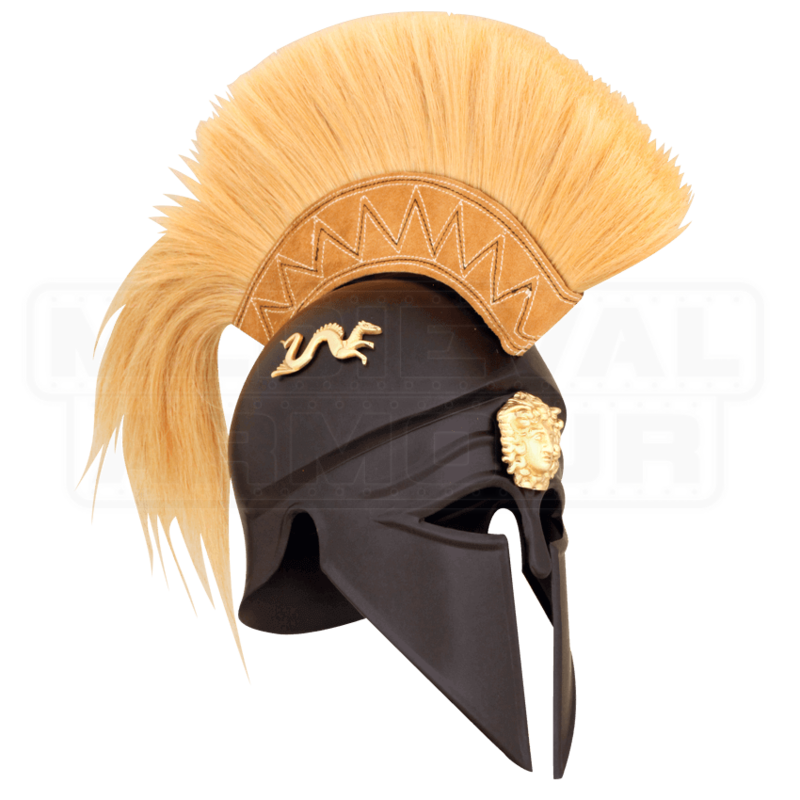 The Corinthian Royal Helmet with Plume would have been favored by the generals, rulers, and royals of ancient Corinth, which makes this a doubly impressive historical replica that would make a fantastic addition to any Greek enthusiasts armory.